“Eh?” I said. I couldn’t believe it. The bus was winding up from Moutiers towards our ski resort, and one of the wives was giving me a sensational piece of news. It concerned the skiwear of two old friends. If she had told me they were going to be wearing padded bras and cami‑knickers, I could not have been more astonished. I mean, I have known these people for decades. We have been skiing together for years, and I can testify that they are, in general, as brave as the next man. When the light is fading and the last lift is about to close, they are the kind of chaps who come to the edge of some vertical mogul‑field and shout “Man or mouse!” before hurling themselves into the icy void. When you are going up in a lift and you look beneath to see a couple of lunatics negotiating the virgin snow of some precipitous couloir, that’s them. If you were casting around for two individuals who were still holding out against the elf and safety madness that is sweeping our culture, I would have pointed you in their direction, and I would have proudly added that they were swifter than eagles, they were stronger than lions — until, as I say, one of their wives came up to me on the bus and broke this amazing news. This year, she said, the men were going to be wearing helmets. “Helmets?” I said. “To go skiing? You mean helmets like kids wear?” That’s right, she said; and would I like to set a good example by wearing one too? I am afraid I did not feel able to accept her offer. In the course of a 35-year skiing career of relentless incompetence, I have been involved in some of the most epic prangs ever witnessed. My falls have taken me from the top of one black run to the beginning of the next – and onwards and downwards. I have sustained all manner of contusions. I have broken a thumb at Les Menuires and a rib at Courchevel. But never, in all the times when I have felt myself being catapulted head-first from my crossed skis, has it occurred to me to wear a child’s helmet to go skiing. Goggles, yes; a woolly hat, yes; but a helmet – not on your nelly. That was my message, delivered as politely as I could. And yet when we arrived at the pistes, my sense of wonderment grew. Something weird has happened, and it has happened in the past couple of years. It is as though the ski helmet has propagated itself like some frenzied bacillus. Everywhere you look there are thousands of skiers – children and adults alike – transformed by their headgear into shiny-bonced tadpoles. It wasn’t my friends who looked odd, I realised: it was me. Sometimes I would find myself on a chairlift sitting in a row of Darth Vaders, and I would pluck up the courage to ask. Why the helmet? I murmured, and after a few days I began to get a fix on the phenomenon. Of course it is partly fashion. Helmets are in this year in the way that ruffs or codpieces or top hats used to be in. They are treated as a new must-have accessory, and much of their success – in the words of Etienne the (helmetless) instructor – is down to “le marketing”. You can get fur-lined helmets and helmets with stereo, and it all means good business for the ski-hire shops. But as almost everyone said, the main reason was safety. It was about minimising risk, they said; and suddenly I realised I was looking at a rich and suggestive illustration of the human herd instinct. Has skiing really become more dangerous in the past couple of years, when people have started adopting these glistening black craniums? On the contrary, the steady improvement of skis and bindings has made the sport safer than ever. Of course there was the sad case of Natasha Richardson, killed in a freak accident on the nursery slopes. But then there are always injuries, and if anything I imagine it might be even more painful, if you are on the downhill side of the argument, to be walloped by an out-of-control skier equipped with a plastic battering ram on his head. No: there is something strange here, a mutation in the Zeitgeist. I reckon the helmet mania is more than just a question of fashion or a re-assessment of the medical risks of skiing. It’s a sign of the psychological state of the Western bourgeoisie in the grip of an economic crisis. They have seen what happened to the risk-taking bankers; they have seen how the sky fell in on the insouciant system of free-market capitalism; and so they literally cover their heads as an expression of the safety-first mentality that has seized us all. I do not say they are wrong, any more than I say my friends are wrong to wear helmets, and I brace myself for the angry letters from those with head-injury stories of loved ones. Each of us must make his or her choice. But I ask you this: does James Bond wear a helmet, when he out-skis the baddie in On Her Majesty’s Secret Service? Look at those pictures of the plus-foured British pioneers of alpine skiing, with their seven-foot skis and dementedly dangerous bindings. Did they wear helmets? Of course not. Skiing is about the wind in your hair and the sun on your face as you personally describe the contours of snow-covered mountains at extraordinary speed. It is the closest many of us come to flight. It is my humble but deep belief that it should involve the maximum communion with nature, and that means no helmet for me. For the sake of completeness I should add that I did hit a tree the other day, but I hit it nose‑first. A helmet would have made no difference – and you should have seen the tree. What a silly article. I love it! Thanks, @circus monkey: I am enjoying the image of Boris skiing in padded bra and cami-knickers. Excellent. Shall we tell him James Bond isn’t a real person? Nah. 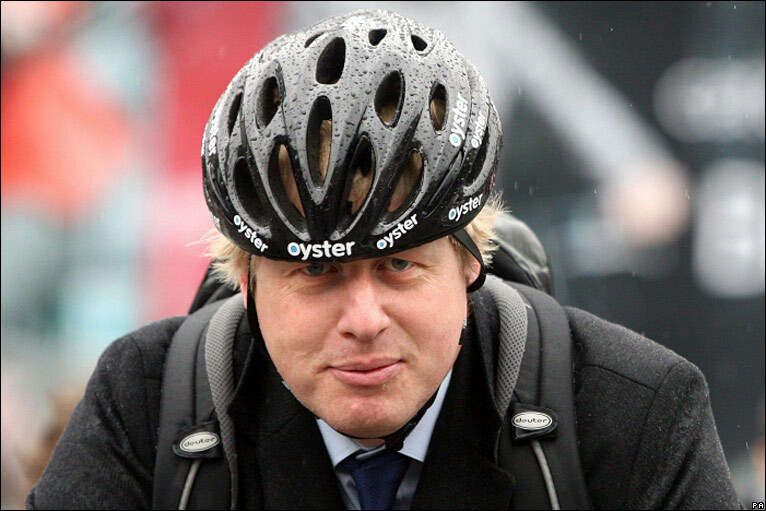 Boris, please wear a helmet! I have no wish to read your obituary for a very long time. Still less do I wish to read that you have become a cabbage following some dreadful collision. @Charlie: I too would vote for Bojo’s safety but I don’t think becoming a cabbage wouldn’t damage his political career. Look at the others! Winterton is a good argument for registering seperate votes for candidate and party. So you may want to Vote Tory but think the candidate offered is a buffoon. If you could register seperate votes it would force the selection of another candidate. Remember the public can only vote for what’s offered by local constituency selection not whom they would prefer. What’s offered might be some outsider profferred to them by central office or it might be some ageing prat well past his sell-by-date thats big in the Rotary club. Personal choice is everything, As a one of the herd, I have worn a helmet for the last 2 years, it was my choice and I don’t miss the wind not being in my hair and I don’t feel a total hypocrite in front of the children who wear helmets. Unfortunately, though, you will soon be forced to wear one, just like a seat belt or a motorcycle helmet as the elf ‘n safety warriors take to the slopes. Omigod! That pic. of Boris, hardly a vote catcher, is it? People have been skiing for years and there was no need for skiing helmets, so I am inclined to go along with Boris and agree that it is all about selling something to the general public. Children should wear them though. This is a fascinating point. The very top fashion designers would seize on this as the inspiration for their latest collections, Psycho Chic or Recessionary Chic or some such thing. Westwood would design padded garments and the models would walk down the catwalk with their arms bound crossed over their chests and secured with tapes, like people wear in padded cells, so they don’t harm themselves. Knee pads and elbow pads. Padded helmets. This massive shoulder pads that US footballers wear. It is so good that we have a Mayor who is sensitive to trends and the influence of politics and sociological problems on what we wear. Boris is plugged into the Zeitgeist. What is the point of skiing? The injuries are appalling and disgusting. Is that the point? Exhilaration that you have escaped mutiliation? Boris likes the sun and breeze on his hair, can’t he just stand by an open window for goodness sakes? To tell yous the truth: When we were young, our parents were too poor to take us on a skiing holiday so we could learn how to ski. Now me and my John can’t even afford a bloody Butlins holiday on our measly OAP pension let alone a posh skiing holiday in a posh skiing resort abroad. If we wanted a meat joint, we would have to lift it, not that we would do that of course. Skiing without wearing a helmet to me seems very risky unless you ski at a slow speed on a flat and smooth ground without any rocks and stones. Maybe Boris only skis at a very slow speed on a flat and smooth ground with his children on a family holiday. Are you there, Edna? Talking about sport, another cry baby here Edna – T Wood cried on TV apologising for scoring too many holes. My John says at least 13 holes. Does this give you the willies? Over to you Edna. My political comment is: I agree with whatever Mr Johnson says or does honestly. Alreet Edith? Long time no see love. Well I’m not really into sport to be honest with you but I know Tiger is the best golfer in the world so naturally he always scores more holes than other golfers so I think they are only jealous of his talent love. Cest la vie love. Cest la vie. Alreet Edith? Keep me well informed love. Take care love. It only takes one fatal brain injury, Boris, it only takes one… Please try one, they only weigh a pound (lop some of the hair instead? ), and if it’s too fashionable for you, you can always blame us, the concerned Readers. Entertaining article. However on a certain level, correct me if I’m wrong, it seems that Boris is in agreement with the “insouciant system of free-market capitalism”, by refusing to wear a helmet? Concerning the wearing of helmets I say each to their own, but surely better to be safe than sorry- remind me what is the Conservative’s stance on sexual education? People wear helmets for skiing now? My God, how long before the EU make them compulsory? i disagree with you Boris , i am sorry, i really am. My argument for wearing a helmet while skiing stems from cycling. Firstly yes i find cycle helmets annoying and they do mess up your hair, they also attract the negative attention of others especially when you are younger. Although the pros of donning that helmet much outweigh the cons. i would often ride around Hillingdon without one but then i was only riding on the pavements as i didnt like the thought of the roads (yes i know its a hazard to pedestrians) i did once in a while slip onto the roads to maneuver around a pram or such like. I say this as if its nothing but in fact it was the biggest risk i could take, riding along with the traffic with no protection on your head is dangerous! then again doing the same on the pavement is not exactly free of risk either! Then i think of going the same speed if not faster down the side of a mountain…. well i would surely be wanting some sort of saftey precaution strapped to my person! Even while driving.. do we not wear seat belts? And in that situation we have a large metal structure protecting us. The truth of the matter is although we are aware of the dangers while taking part in activities such as this, people all seem to have the same opinion. “oh but it wouldnt happen to me” which is all well and good but neither do we expect to be run over by a bus on the way to work, but it sadly does happen (rarely). i was adamant about not wearing a helmet, i had one purchased for me which i refused to wear, then one day my mother forced me too and said from that day on i was not allowed to use my bike to get to school without wearing it. I am a perfectly able cyclist i pride myself in being able to get home with a shopping bag on each handle bar (of equal weights of course)and full rucksack on my back. Then the day came, riding up wiltshire lane behind an h13 which stopped in front of me, now sometimes it does this at that particular spot, so i not thinking came out from behind to cross over onto the pavement… And did it hurt! I remember going slow motion through the air, i pulled in my arms and legs so as to reduce the effects of the fall.. and landed on the road, my head however had landed on the curb! I could of easily landed up in hospital or worse not making it there at all! So although we make everyone aware of the dangers of what we do. Like with most things, we cant understand it or imagine it happening to us unless it already has or we have seen a loved one go through it. Its no lie that skiing can lead to fatal consequences! We need to consider every outcome before taking part in things such as this and if looking silly prevents you meeting mr grim, then so be it! Maybe we should use the scare tactics like those on tabacco to get the message through, sadly some people are not worried of death, but i would be 99% sure they would not want to be in a catatonic state. Boris i beg of you please realize the risk you are taking and briefly cover those lovely locks whilst speeding down the side of that mountain..please…. A nicely written article. I don’t wear a helmet cycling down country lanes, but would always wear one in London. I don’t wear a helmet skiing, but always wear one rock climbing. In the end, it is down to your perception of risk. It is very much a private choice. What people forget, is that the activity is intrinsically dangerous, and wearing a helmet only very slightly reduces the danger. In other words, if failing to wear a helmet while skiing is irresponsible, then simply going skiing at all must be vastly irresponsible. If I were PM, I would ban skiing totally, like I would riding bikes and swimming. It would be obligatory under my rule to practice meditation and Zen Buddhism daily and also pray. Driving cars would also be banned and anyone who used a thin plastic bag would be smothered with one. and uncomfortable, it looks silly. However, I wouldn’t dream of batting without a box. It is clear what is important to you Ed. ps. Helmets are not as safe as some people are implying, read the report above. I was only joking with my remarks about skiing earlier and did not wish to offend. i am sure Mel looks absolutely beautiful as she glides down various mountains and I bet Boris is a briliant skier too. I am so clumsy myself, with weak ankles, it would be courting disaster to try. I did do ballet, which I enjoyed, but lacking balance, when I pirouetted, I would spin faster and faster and then crash into the wall. In the end the despairing teacher told me it was like burlesque. In an earlier comment I proposed the ability for a constituency to rid themselves of an undesireable candidate. I anticipated the answer some people may have given in waiting til the next general election, but then you may want to vote for the party but not the candidate. That comment got more negative votes than positive but no reasons why. In an attempt to invite that reasoning I suggest some kind of recall facility again. My comment also included a rather frivolous support for Tim Loughton. I did think he came over well on Tower Block of Commons and happened upon a link to his personal political messages whilst trying to find a link to the last episode of the prog. In one of those messages he too suggests some kind of recall facility. So OK, there is a serious side to me but I liked his enthusiasm to join in with his hosts too. PLease have a look at this proposal here before you decide on the issue of recall. Thanks. Thank god someone else disapproves of ski helmets. i fear avalanches more than a crazed skiier crashing into me and from experience, if i wore a helmet i probably wouldn’t hear either one coming. With any dangerous sport, you should wear a helmet. Hitting your head off a tree at even just 10mph is enough to do serious damage. I noticed this article last week; as skiing is a sport close to my heart I thought you might be interested in a couple of facts. I have live in Norway and have done so for a few years and I ski regularly with helmet as do my children – I even insist on them wearing back-plates during their acrobatics on the jumps. – There are 0,7 injuries requiring medical assistance per 1000 days skiing. This means that a skier who skis 4 days a year can ski roughly 350 years before having an accident. So I say tally ho Boris! It’s worth noting that wearing a helmet while *snowboarding* makes a little more sense. Although ski-related head injuries are fairly rare, the nature of the common falls when snowboarding means that a bang to the head is much more likely. The most common head injury is concussion from catching an edge and falling over backwards – a helmet is specifically designed to absorb this sort of impact and can lessen the damage and may prevent loss of consciousness. A much more dangerous injury is from “scorpion-ing”, when a hard or high-speed fall, usually face-first, causes the snowboarder’s spine to bend back and the snowboarder ends up hitting oneself in the back of the head with the heel edge of the board. Again, most helmets will lessen the potentially fatal damage in this instance.